My birthday was the 26th of October, and I was inducted into the Israeli Army on the 22nd. That was one hell of a birthday present. I've always wanted to be a soldier, especially for the only army in the world that I think is 100% imperative for the existence of the state it serves. So, ideologically I didn't need cake or toys or songs. On the other hand, it was really tough spending your birthday getting yelled at. On the 27th, a day after my birthday, my mem"mem (the commander of half the group of 100 soldiers in my course) pulled me aside and asked me why I didn't tell anyone that it was my birthday. "Uh, I didn't want to get singled out..."
They did give me a break, however, and didn't put me on guard duty (shmira) during the middle of the night. 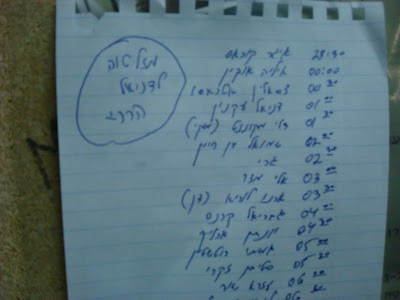 On the upper left it says "mazaal tov to Daniel." On the right notice the times you have to do guard duty. The second night I had guard duty at 4:20 am. The best present in the army is sleep, and I got exactly what I wanted this year! Daniel... great coverage. i'm being drafted in 9 days and It's nice to get a little bit of a preview. Any idea what assignments are available?